Happy Valentine's Day! Yeah I know I have mixed feelings too. My husband and I usually leave each other several cards scattered around the house (refrigerator, washing machine, car windshield)--this year I bought some pretty paper and used my new alphabet stamps to MAKE CARDS. Childish, awkward cards, but still. Anyway: to further explore my mixed feelings about compulsory hearts & flowers, I wrote a creepy piece about the dark side of love for the Cabinet of Curiosities. If you'd like to add a little bitter to the day's unrelenting sweetness, check it out. 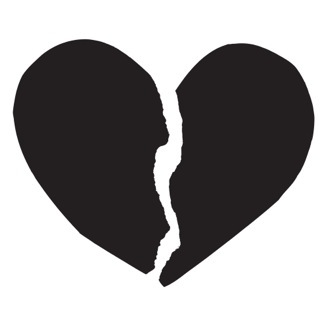 I stole this very nice black and broken heart from a place that sells t-shirts with this image. Click the image to go there and buy one so I won't feel guilty about using it.